Travel to Lafayette via I-10 from the east or west, or south from I-49, take Exit 103 to Highway 167 South (Johnston Street). This will take you all the way to Abbeville (30-40 minutes). When entering Abbeville, take a left at La. 14 Bypass (first red light). Go 2 miles and Sunbelt Lodge is on the left. Take Highway 14 through Gueydan, Kaplan, and into Abbeville. From the first red light (corner Highway 167 and Highway 14), go 2 miles and Sunbelt Lodge is on the left. 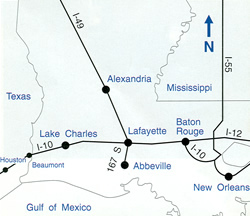 Go west on Highway 14, through Delcambre, Erath, and into Abbeville. Sunbelt Lodge will be on your right.